This is a great new NAS Box for running XPEnology. I used DS3615xs 6.1 Jun's Loader 1.02b with DSM_DS3615xs_15152.pat file. I keep getting error 13? Did you set the correct VID and PID of your USB Stick? I forgot to do that thanks. doesn't it go in the cfg file in the usb stick? See my signature for how to. Anyone know if Xpenology will work in the 4 bay one as well? I've got a strange problem with mine, that I'm hoping someone can advise me on. FYI, I tried DS916+ as well that booted but, couldn't find any HDD's. I followed step by step instructions from Polanskiman but for some reason it is not working on TerraMaster F2-220. Only power light (LED) turns green. It initially gets an IP from my router (198.168.1.x) as DHCP but LED for LAN still does not turn on. Synology web assistant did find my NAS. After successful install it reboots, and, then it lost IP address and never gets it. Since no IP address is assigned it does not go to the next step. Also, during the install process LED for HDD activities do not lit either. Unfortunately I don't have VGA cable to see any activity on computer screen. I tried converting USB to GPT and also to MBR. But, same result. TOS (original OS from TerraMaster) works perfectly fine. Suggestion? That sounds like what was happening when I was trying a DS916+ install. I don't think it has the NIC drivers. Try using a DS3615xs or DS3617xs loader and install. You could also try removing any RAM that's been added, that is still causing me issues. ZaFord - Thanks for your suggestion. I did use DS3615xs in all of my tests. I tried all other loaders too but for some reason nothing seems to work. I tried different USB too, still no go. I then tried DS3615xs on Acer PC (AXC-603-UR2C) after removing HDD. Cursor blinks at boot time and no message and no IP address. I then tried this same loader on Gigabyte motherboard (model GA-Z77-DS3H). On this board it showed initial message but never got an IP address. Everything else on my network is working fine. Other suggestions/ideas? I tried alternate extra.lmza using OSFMOUNT (by renaming original extra.lmza to extra.lmza.bak and copying downloaded extra.lmza to the same folder) but still no joy. This time message displays for a few seconds and system reboots and this process repeats. I also tried converting UBS from GPT to MBR and vice versa with other boot loader too, still no success. There are too many combinations to try. I think the best option is use serial port. I do see LPC (Low Pin Count) connector on F2-220, but I don't know the pin layout. I do have USB to serial converter and I can use it with putty as console. If LPC connector can be used for this purpose I'd love to give this a try. Any knows if LPC can be used with serial console? Also, pin layout for PLC connector. I think all I need is GND, TX and RX pins for serial console. also, as a test also try XPE 5.2/DSM5.2, if that works then you can telnet to the box and check the hardware configuration and see whats installed. Its possible that on a low cost unit like this, the components are different to the version @mb51running has. I dont think you will get a serial connection to the unit, its not the plc connector, but if you look at the mobo for other connectors, there might be a hidden one there. good old realtek problem maybe (two different drivers)? Thanks guys for chiming in. I tried XPE 5.2/DSM5.2 today but I got "failed to install file. The file is probably corrupted. (13)". I made sure VID and PID are matching with my USB values. Overall behavior with 5.2 was similar. Synology assistant did find my NAS initially. But then at installation time it issued this error. I've also ordered VGA to 12pin ribbon cable connector, but I don't have big hope. On PC monitor there's not much information displayed anyway. I also checked NIC chip and it is same as mentioned in the review link posted by IG-88 (RTL8111F). I think drivers in Jun's loader are working fine as F2-220 can be found by Synology assistant at startup. The problem is somewhere during or after the install. 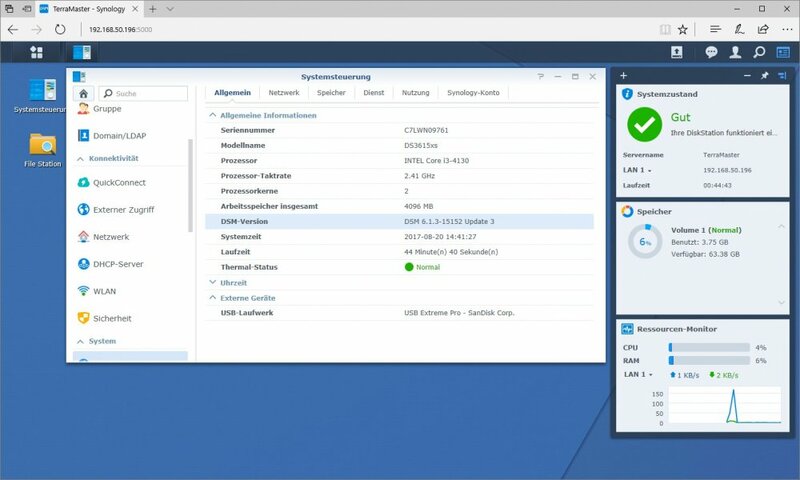 I noticed LAN LED never turned on, even at the beginning when Synology assistant can find F2-220. Can I fix this two problems? Another little problem is that the DSM say me that I have 10 free slot... this is the last problem... but if I can change a config to set that the max number of disks are 2. Is safe to DOWNLOAD from DSM the last update? Or I have to do a "migration" ? I'm italian so the screenshots are in italian, sorry for that. I put this link in mind and I will check for every update. Thanks for help and I hope that my post will be usefull for other user with F2-220 and the same questions. With original TOS I had some problem with the Terramaster software and with USB3 not work after reboot. Now I have a good hardware with a good software!!! I hope the loader will be update for future major release. I´ve installed last version of Xpenology in Terramaster F4-220 smothly. Only problems are related here: red hd lights, soft power off with button doesn´t work (but ok by web), and I don´t know if wake on lan and hd stanby will work. I don´t know wich OS is better: xpenology with that issues, openmedivault, or left inside original TOS. I keep getting file corrupted error. Tried different flash drives, GRUB edits checked and double checked. No luck. Have you set the correct vid & pid for the USB key?